Northward view from the Lake Tahune helipad around sunset. 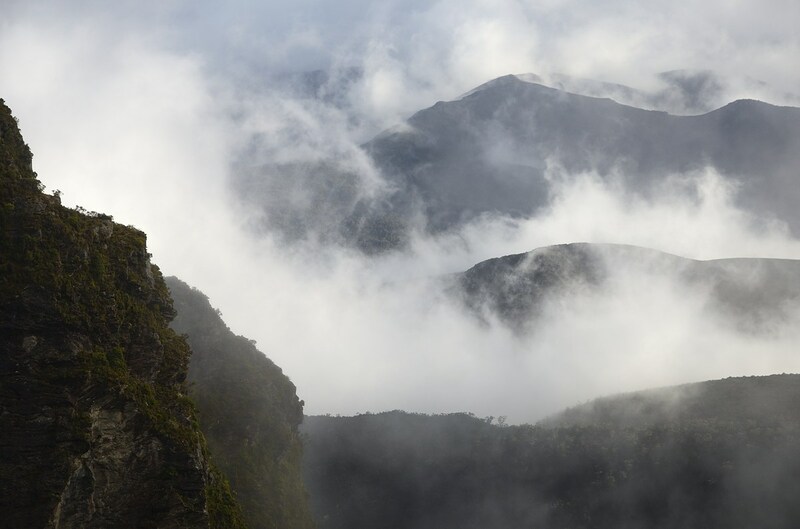 The Frenchmans Cap area is one of the most spectacular parts of Tasmania. It is wild, remote and quite inaccessible, except for the one track leading from the Lyell Highway to the summit. Walkers usually take three to five days to climb Frenchmans and return. Longer itineraries provide more opportunities to reach the summit. Parties need to be fully prepared for poor weather, and accept that the weather may mean they cannot climb the peak. In common with many other Tasmanian walks, Frenchmans Cap has obvious hazards - precipitous cliffs, snakes and poor weather. People often under-estimate Tasmanian weather. It can be bad enough to cause hypothermia in any season, and deep snow can fall on the higher peaks at any time of year. 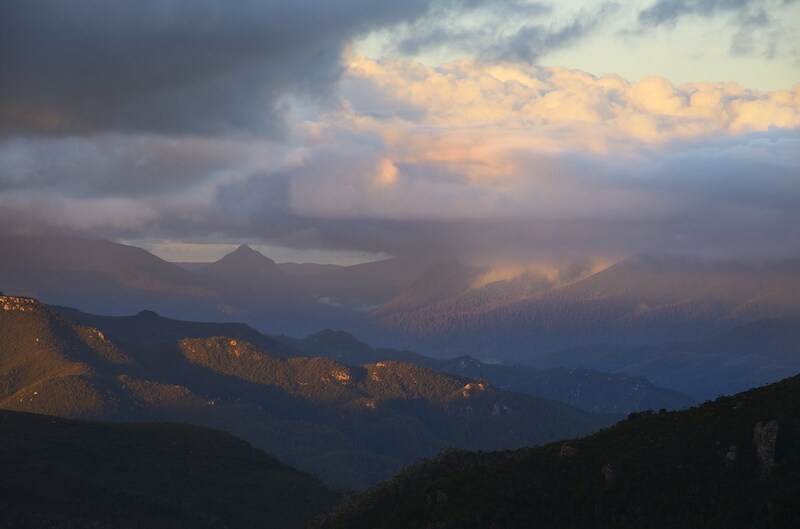 Read this guide before undertaking walks in Tasmania. Although not to be relied on, there is Telstra 3G access from the summit and other high points along the track. the carrying of a registered personal locater beacon (PLB) is recommended. Very fit parties walk from the highway to Lake Tahune in a long day, but for most people walking this whole distance on their first day is not a good option. A three-day visit would normally be undertaken by walking in to Lake Vera and daywalking the summit from there. This will make for a long second day, and provides only one opportunity to reach the summit and see the view, around lunchtime on day 2. Four-day trips would normally include a summit trip either (i) on the afternoon of day 2, having walked up to Lake Tahune in the morning, or (ii) on the morning of day 3 before walking back to Lake Vera, or even (iii) both. Five day visits allow more flexibility again, providing more opportunities to go to the summit and more leisure to take the quite arduous walking at your own pace. A further option would be to walk out from Lake Tahune to the highway in one long day. This would be less arduous than the inward journey. Some parties also choose to walk out as far as the Loddon River and then do the last bit over Mount Mullens on a final day. If you are not fit and experienced in this sort of walking, I strongly recommend a four or five day choice. On my recent trip, I allowed 5 days, and used them all, although I considered walking back to Lake Vera on day 3 having been to the summit that day. Driving from Hobart, you head for Queenstown. The road is slower than you might imagine given the distance, so allow extra time. You drive to Derwent Bridge and then around 29km further on there is a large carpark and information display. Just a warning, theft from vehicles has occurred at the start of this walk in the past, although I haven't been able to determine if anyone has had trouble recently. Leave no valuable items in vehicles. The timing shown assumes you have allowed five days. Day One: The walk commences descending to the Franklin River and crossing it on a suspension bridge, before turning west and undulating around the hills and across some small plains. A boot-washing station is passed, and then the track starts to rise. There is a quite solid climb to the shoulder of Mount Mullens, before the well-made track descends steadily to the Loddon River. Getting there is likely to take two hours or more. Depending on start time, this may be a good spot for lunch, and there is even a seat. You can camp here. The Loddon River is crossed on a suspension bridge, and you are now on the (sodden) Loddon Plains. However, the track has been greatly improved over this first section. After a while, you will notice a significant deterioration however. This is the soon-to-be avoided southern section. A new track has been cut and will open sometime soon (as at Apr 2013). This track will head up Laughtons Lead, cutting off the southern Loddon Plains and Philps Lead. It will no doubt be impossible to miss once actually opened. For now, the old track heads south across the quite muddy plains - the wettest bit of the old track. It then turns southwest up Philps Lead, and this section is less muddy, although just as wet, and tends to consist of standing or flowing water in runnels. However, these runnels have mainly eroded down to the gravel beneath and make for better walking. UPDATE: The Laughtons Lead section is now open, and you will find the track should now be a doddle. Hopefully it's made well enough not to collapse into new bog holes any time soon. At the upper end of Philps Lead (where the new track will emerges), the track re-enters the forest and climbs quite steeply over the hill and down to Rumney Creek and then the Lake Vera Hut. This hut sleeps around 20, but would be pretty cosy at that capacity. 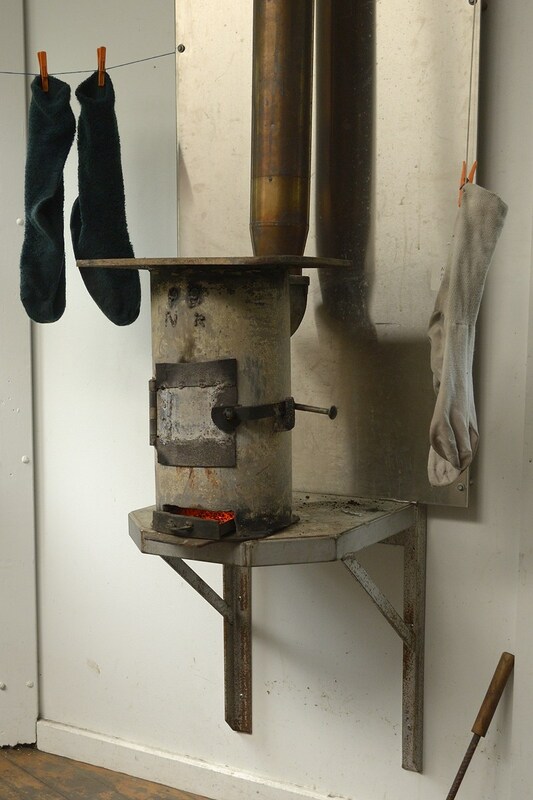 The hut has a coal stove. Firelighters are very useful for getting these started. (Visitors note, huts are unattended. You can't buy food there.) There are some tent sites further along the track, but visitors are requested to use the hut in preference. Day Two: From Lake Vera Hut, the track twists and turns around the edge of the lake. This section of track has been upgraded in recent years which makes it easier, but progress is not rapid. At the far end of the lake, a creek is crossed on a small footbridge, and then the ascent to Barron Pass commences. This is a long, steep, wet climb, with many tree roots and slippery sections. However, it has also received a lot of attention, and many of the harder bits have been improved in recent years. This climb takes some time, but eventually you will emerge at Barron Pass, a great spot for a rest in good weather. If it is clear, you will have a magnificent view of Frenchmans Cap and surrounds from here. Alternatively, and probably just as likely, you may be inside the cloud. The pass is flanked by Sharlands Peak to the north and the ridge leading to Philps Peak to the south. From here the track falls and climbs steeply and roughly around the slopes of Sharlands Peak. This section takes some time, and requires care with a large pack. After a while the track descends into Artichoke Valley, a wet area over-shadowed by strange rock formations. This area was severely burnt in the 1960s, and the dead pine trees are very obvious. The track climbs and falls steeply beyond here, partly on ladders, before emerging quite suddenly at the Lake Tahune Hut. This hut is spectacularly located below the northeast cliffs of the Cap, and has a helipad with grandstand views to the north, including the Eldon Range. There are a few tent sites along the track that goes to the lake shore. The hut supposedly sleeps 16, but this would be very cosy. It has a coal stove. Lake Burbury from Frenchmans Cap. Day Three: The track continues past the hut and starts to climb steeply up the obvious gully to the North Col. The track was re-routed here a long time ago, and now makes a large zigzag across terraces above Lake Tahune. The climbing here is quite easy, and the views around make for very enjoyable climbing. Having zagged back towards the Col, the route heads more steeply up the rock to the left (south). There are some scrambly sections, including one bit some will find tricky in a gully. With care and thought, this will be passed with little difficulty for most people. In snow or ice, you will need to consider whether proceeding is actually safe given your level of skill. There are certainly a couple of spots where a slip could result in serious injury. The route is well marked and winds up the steep slopes, eventually becoming more gentle and arriving at the summit at the edge of the enormous cliff. Of course, great care is required, as a fall would be undoubtedly fatal. On a clear day, the views are astounding, and well worth the effort required to get there. Hopefully you have made time to be able to remain a while and soak it all in. You can spend a fair time wandering about the plateau. If you have a full day for exploring the area of the peak, you can make your way to the North Col and beyond. 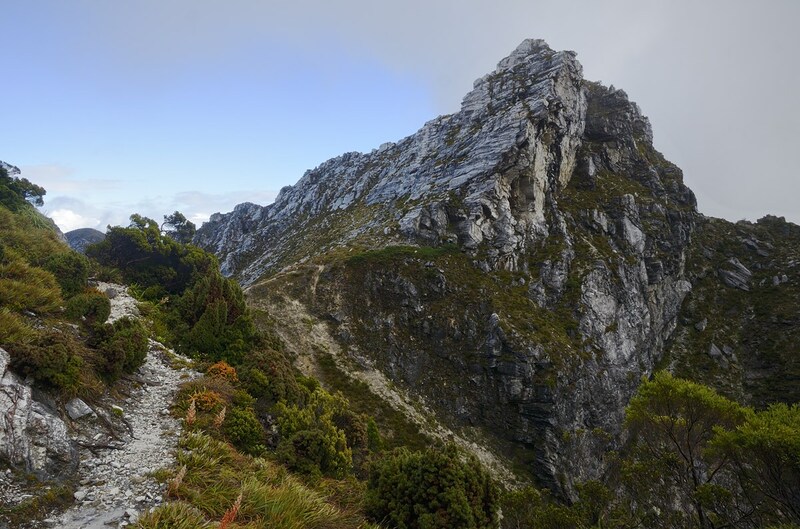 A track heads further west along the ridge of the Lions Head, and eventually drops a long way to the Franklin River. This makes for a long return climb if followed all the way, but the first part of the ridge provides good walking and different views for those with some spare time. The return is merely a retrace of your inward journey, and as noted above your return itinerary is up to you. 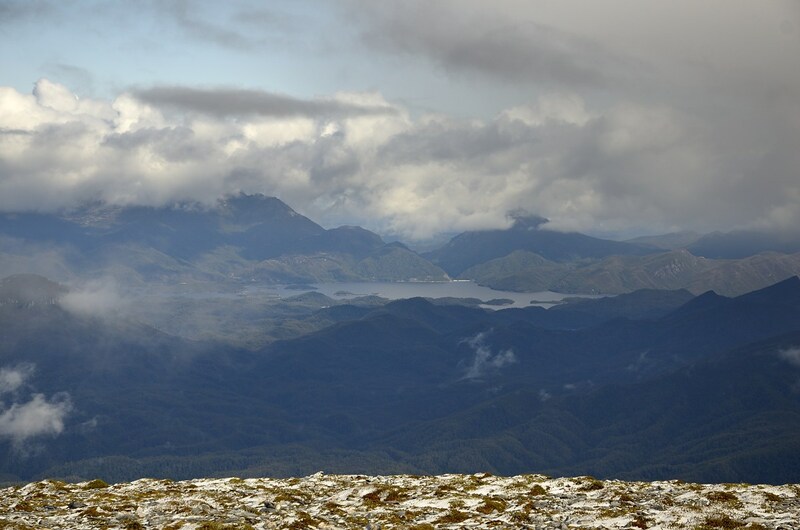 Nearby Sharlands Peak can be climbed relatively easily from along the track. Clytemnestra, Philps Peak and Mt Agamemnon are more complex. The book The Abels Volume 2 (Bill Wilkinson) contains descriptions of how to attain these summits. They all require off-track walking and navigational expertise. Frenchmans Cap Walk Map and Notes - I suggest getting the laminated waterproof version from the Tasmanian Map Centre at 100 Elizabeth St, Hobart. For really good detailed info, get the 1:25,000 maps Vera 4031 and Loddon 4032. These are also available laminated from the Map Centre as above. The Parks and Wildlife Service have a page about this walk here. The Abels Volume Two - Bill Wilkinson has good information about climbing Frenchmans Cap and surrounding high peaks. John Chapman's South West Tasmania has a good description of the walk.